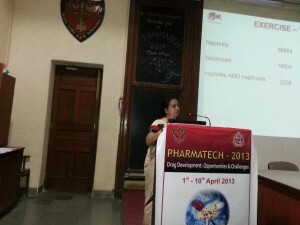 Dept of Pharmacology & Therapeutics, Seth GS Medical College & KEM Hospital Mumbai had organized a 10-day workshop – “Pharmatech” for PG students of Pharmacology. This event happens every two years. Vasumathi Sriganesh gave a lecture on Literature Searching on April 3, 2013 (the third day of the event). We write to thank you for being with us during “PHARMATECH-2013”. Your session on “Effective Literature Search” was appreciated by the participants. The feedback given by paticicipants speaks for itself. 99 % of the participants rated your talk useful. We look forward to a continued interaction with you in future. ← South Asian Cochrane Network & Centre Features the Award!